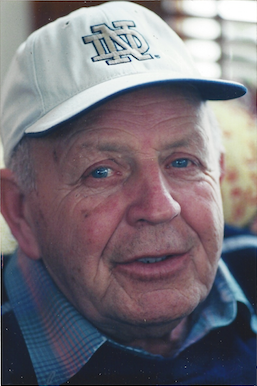 Raymond Joseph (“Mooney” or “Moon”) Clavelle Sr., 91, of Winooski, Vermont, died on February 25, 2015, at Birchwood Nursing Home, where he had lived for the last two years. Mooney was born in Winooski on October 14, 1923, to Rena (Provost) and Alfred Clavelle. Mooney attended St. Louis Convent and Winooski High School (1942), where he excelled in three sports, culminating with a State championship in basketball; this led to his lifetime love of sports. He served in the US 35th Infantry Division during WWII and received two Purple Hearts. His injuries occurred as a result of support given after the initial invasion of Normandy Beach on D-Day, June 6, 1944. He and Eleanor Horton were married in 1946 and they had five children. Eleanor survives him after 68 years of marriage. Their children and spouses include Ray Jr. (Kathy), Peter (Betsy Ferries), Betsy (John) Cain, Anne (Tom) Obbagy, and Steve (Bonni) Clavelle. One of the great joys in his life were his twelve grandchildren (who affectionately called him “Dak”); Sean Cain, Rebekah Cain Louis, Justin Obbagy and Eliza Obbagy, Adam, Alex, Luke, Will, Jae, Chelsea and Courtney Clavelle, Awil Hussein, and great-granddaughter, Eleanor Obbagy. Moon was predeceased by many of his friends and relatives, but he was especially close to his only sibling, Bob, who died last year. After the War, Mooney worked in the American Woolen Mill. From 1948 to 1959, he and his brother Bob ran Clavelle Brothers IGA in Winooski. After a short stint at GE, he worked for IBM, for 26 years, retiring in 1986. He was also Winooski’s Tax Collector for over 45 years. The family gives special thanks to the Birchwood Nursing Home staff for all the love and caring they gave to Ray. The “Great Moon” loved his summers at Camp Overlake in Malletts Bay. He was a generous and hard-working man and he had great faith. He loved attending/watching mass and saying the rosary daily. Mooney was an avid Notre Dame, Celtics and Red Sox fan. A Mass of Christian Burial will be celebrated on Monday, March 2, at 10 a.m. at St. Stephen’s Church in Winooski. Interment will follow at St. Francis Cemetery in Winooski. Visiting hours will be on Sunday, March 1 from 4-7 p.m. at Lavigne Funeral Home and Cremation Service, Winooski. In lieu of flowers, contributions may be made to Howard Center, 208 Flynn Ave., Burlington, VT 05401. Online condolences may be shared with the family at lavignefuneralhome.com.